A man – John Camilleri, 67, known as Giovanni tas-Sapun, of St Paul’s Bay – has been killed in a car-bomb explosion in Bugibba. I woke to the sound of sirens blasting down Burmarrad hill and they didn’t stop for half an hour. A major traffic accident perhaps, but there hasn’t been one on that stretch of road for years, not since it was remade. And then the news: another bomb in another car and another man dead. And I thought, there goes another diesel smuggler. 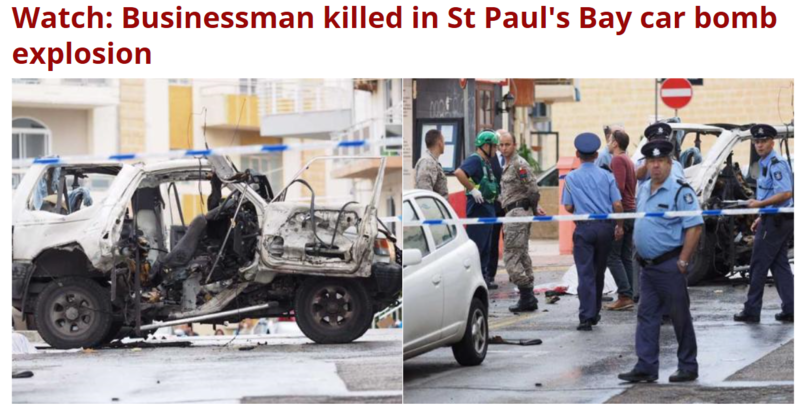 Because the discernible pattern in criminal assassinations over the last few years in Malta is that diesel smugglers are blown up by bombs in their cars, and drug smugglers are shot dead by hired hitmen. And everybody pretends there’s no pattern. The diesel smugglers are described as ‘fishermen’ or ‘restaurateurs’, and the drug smugglers are called long-distance lorry drivers or hauliers, or ‘unemployed family men’ or ‘businessmen’, though some of them are occasionally described as ‘known to the police’. There was one exception, last month: a haulier who was blown up by a car bomb rather than shot. But then the bomb was different to the ones used for diesel smugglers: it was packed with tacks, nails and ball-bearings and didn’t kill him, but led to his legs being amputated. Today’s dead man, too, is a ‘businessman’ who is ‘known to the police’. The legitimate side of his business is tiles and bathroom fittings. The National Statistics Office, in figures released five days ago, says that it calculates “prostitution and illegal drugs” as making for €17.1 million of Malta’s gross domestic product last year. Quite frankly, I think that’s a conservative estimate.